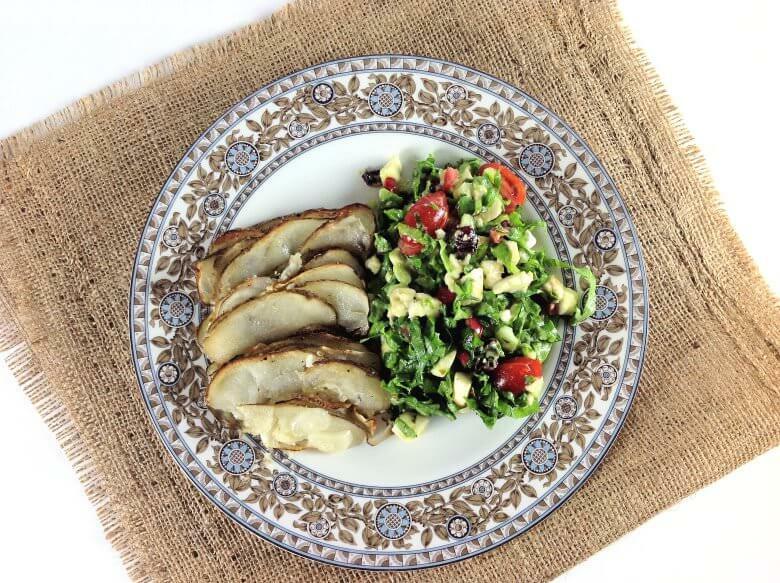 A close relative to the Hasselback potato – the roasted accordion potatoes – or maybe a relative to the scalloped potatoes, minus the sauce. Whichever one you pick, this dish is easy to make and results in a side dish with a crispy crack to it. There is only a risky part about this dish and that is to keep in truly vegan/vegetarian. Slicing the potatoes thin is not without risking your skin, at least it is for me. I don’t have a mandoline slicer, I cut the potatoes with a grater that has a slot for slices and then you risk slicing you finger, thumb or the thenar of your hand, the area where the thumb meets the palm (what I always call the human drumstick). Luckily, this time I came out of the battle unscathed. Of course you can also use a sharp knife. I used russet potatoes for this dish and left the skin on. 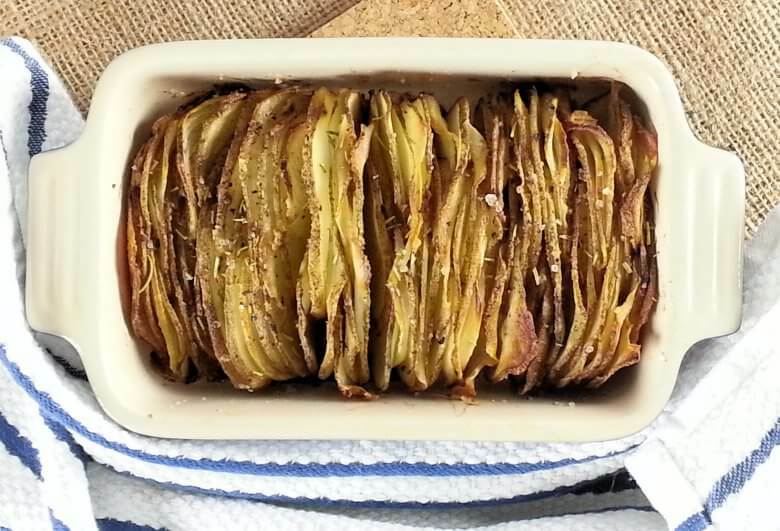 It is a rather thick skin, so slice the potatoes thin and you will get crackling crispy skin after roasting; thicker slices may become a chewing nightmare. Furthermore I used rosemary and coarse kosher salt; rosemary is a powerful herb and you only need a little bit to get the roasty flavor; the added coarse salt gives it an additional crack. Rosemary and roasted potatoes; that’s aromas from the Provence isn’t it. Stack the potatoes tight, and place here and there a slice of shallot. These shallot slices will add just a little extra dimension to the dish. Last recommendation; grease the dish well, the potatoes tend to stick during baking and then is will not be easy to get them out of the dish. I served the potatoes with a mixed green salad with cranberries, avocado, mozzarella, and tomatoes. Grease all sides of a baking dish, 4.5x7 inches with olive oil. 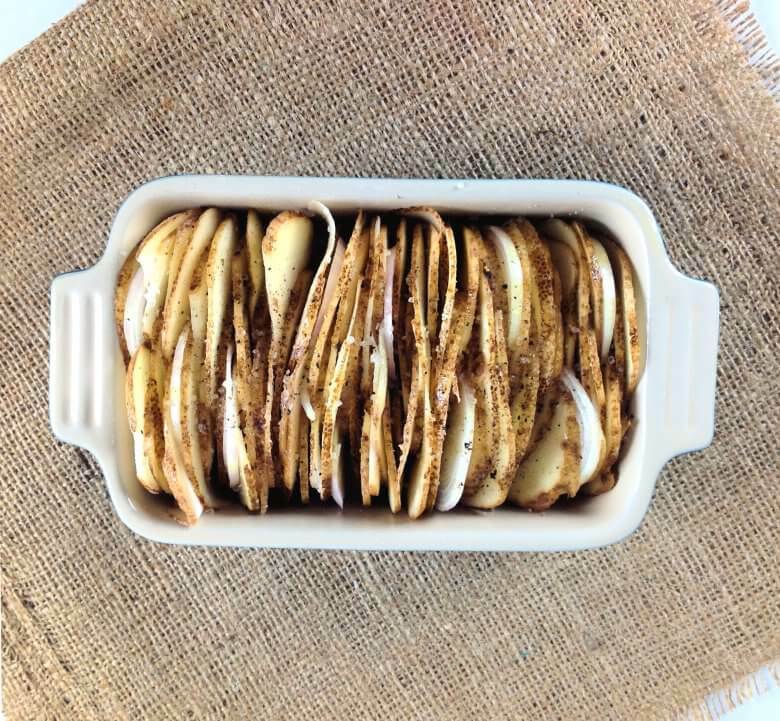 Wash potatoes and cut them in thin slices lengthwise (approx. 1/8 inch thick). Cut the shallot in slices, the same thickness as the potatoes. Place potato slices upright in the dish, starting at the short side of the dish. Fill the dish with the potato slices. Slide the slices of shallots between the potatoes, evenly divided over the dish. Drizzle olive oil over the potatoes and sprinkle with salt and pepper. Bake uncovered dish in the middle of the over, approx. 45 minutes. Reduce heat to 325 degrees F, sprinkle the potatoes with rosemary and bake for another 20 minutes.